Some recipe ideas come together on the first try, without any mess or fuss. Others are true labors of love, like grains that simmer and simmer but never get soft until some unexpected moment at the end. This recipe happens to be one of the latter. 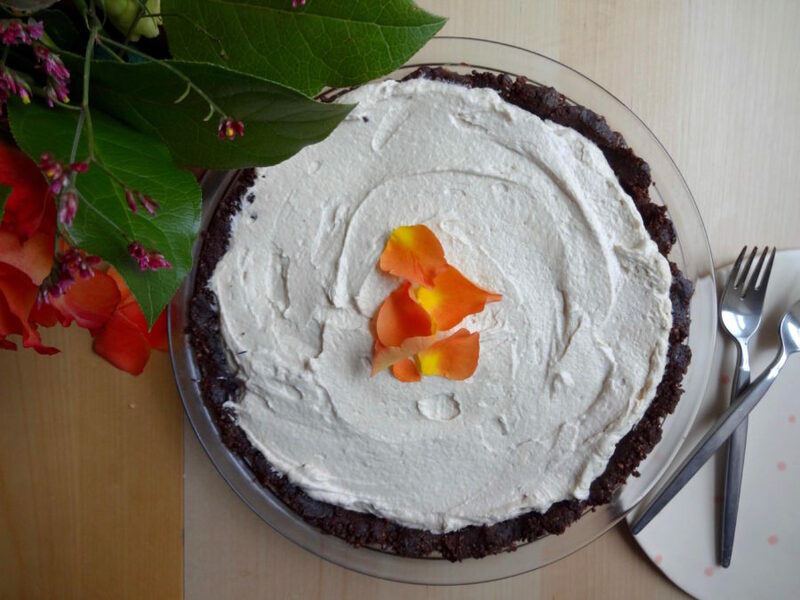 With these flavor visions in mind, I began recipe testing tahini cream pie, with a dark chocolate crust, and a hidden layer of chocolate ganache at the bottom. It would be dairy-free, perfect to serve after any meal. 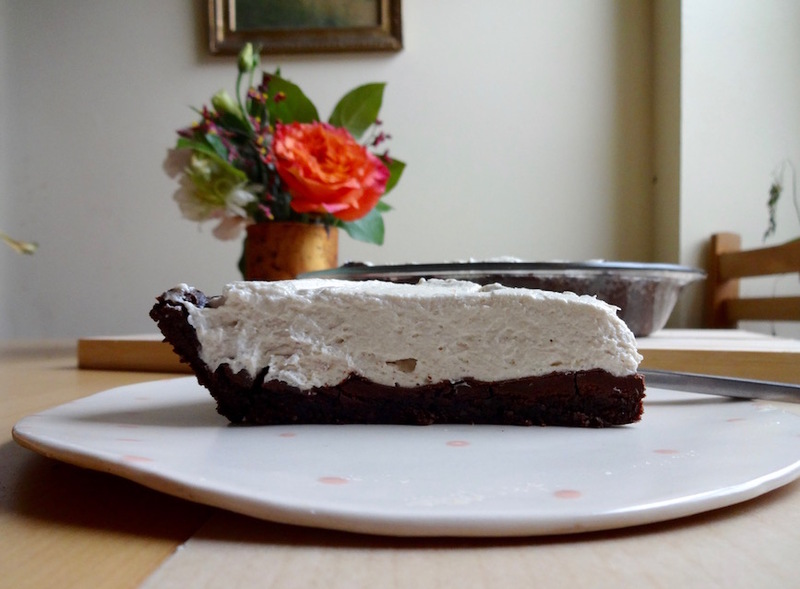 I’ve always loved the challenge of making rich, decadent desserts without dairy. My discerning roommates and neighbors enlisted themselves every weekend over the past few months as taste-testers, happily devouring each and every version. We’ve had cookie crusts, shortbread crusts and almond crusts. A number of surprising ingredients, like tofu, coconut oil and even homemade cashew cream cheese found their way into the fillings. While each trial and error resulted in something magnificent, each had a wrinkle to smooth. 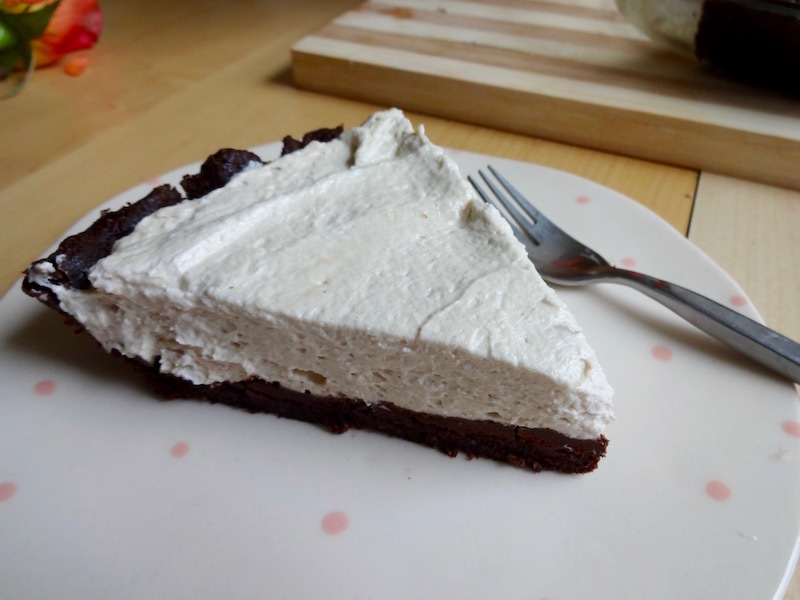 Normally I don’t chase after such finicky ideas, but I believed in this pie, and it seemed to believe in me. In the end, the recipe with the simplest ingredients and easiest directions clearly won out. You won’t find any tricky gluten-free ingredients or dairy substitutes in here — you might even have these items ready and waiting in your pantry. Since the directions are so easy, I think you’ll find that the hardest part is waiting for it to chill! Nothing feels more right this week than to give something homemade and hard-won to the people I love. Finally, here’s the recipe they’ve been waiting for! Either an 8-inch springform pan lined with parchment paper, or a 9-inch pie plate. Hand mixer or stand mixer and a food processor. First, chill a tall glass or metal mixing bowl in the fridge for at least 20 minutes. Meanwhile, make the crust. 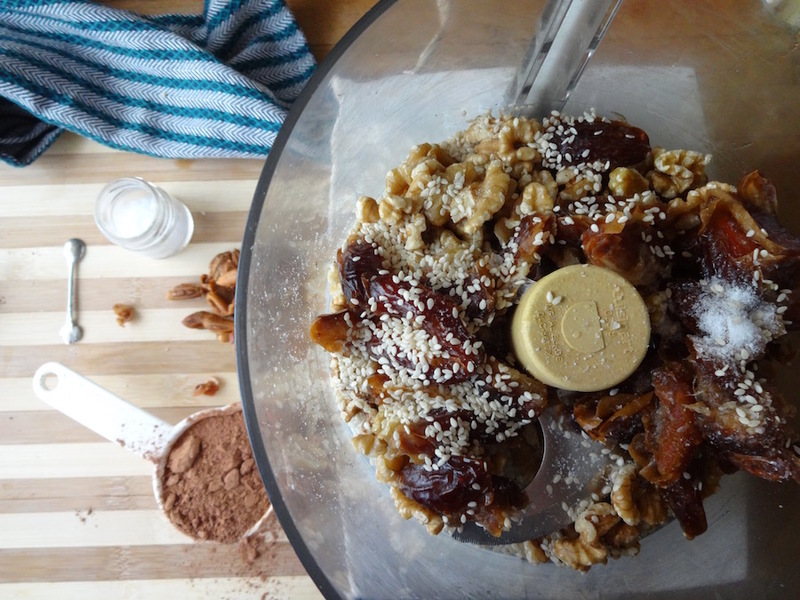 In a food processor, blend the walnuts, drained dates, sesame seeds, cocoa powder and salt until the mixture looks blended throughout. Walnuts should be processed into small pieces, and dates should be smooth like a paste. Press the crust mixture into the bottom of your pie pan of choice. If you want to use a springform pan (so as to display the pie without a plate), be sure to line it as best you can with parchment paper. Use your fingers to press the crust in an even layer on the bottom and sides. Next, make chocolate ganache. Place chocolate in a double-boiler, and let melt for a minute or two. Then add milk, whisking until your ganache has a smooth, even consistency. Spread ganache onto the bottom of the pie and top with sesame seeds. Place in the refrigerator or freezer to firm up. Last, make the filling. Remove the cans of coconut milk from the refrigerator and open them. Carefully scoop out the hardened, creamy top layer (about half of the can) into your chilled bowl. Try not to scoop any of the coconut water that sits below the cream into the bowl. Pour the coconut water into another container to use in smoothies. Next, with the mixer turned off, break the chunks of coconut milk down into smaller pieces by pressing the blender into the hardened coconut cream. 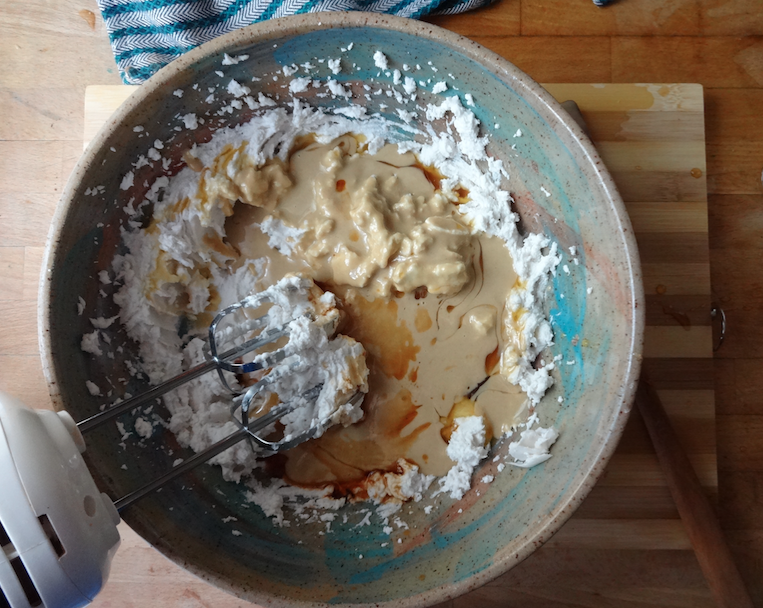 Next, mix on the lowest setting until it comes together as a stiff, whipped cream texture, gradually mixing faster. Add the tahini, vanilla and powdered sugar or maple syrup. Blend until smooth, about 30 more seconds. 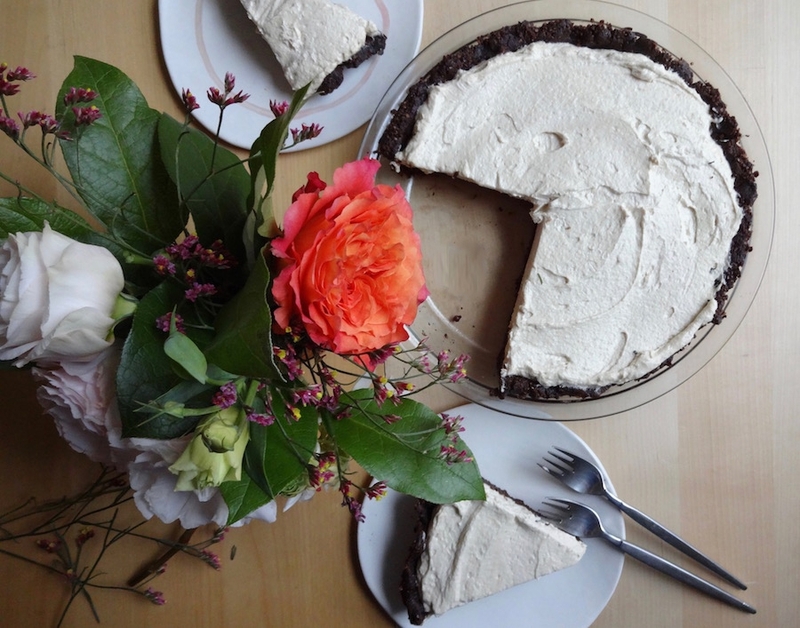 Remove the pie from the fridge and spread the filling atop the ganache. Refrigerate for 2-3 more hours, and serve!